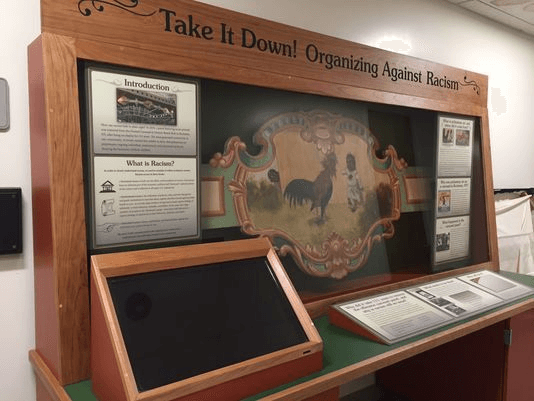 A controversial panel displaying racist artwork that was removed last spring from the Dentzel Carousel at Ontario Beach Park is going on display, with its first stop being downtown’s Central Church of Christ. Tonight’s event is cause for celebration. After community debate and discussion, the RM&SC’s creation of the display is a Rochester success story. After a local blogger brought the panel to light, many ideas were proposed: leaving the panel as it is, adding an explanatory text, moving the panel to storage, donating the panel to a local museum, or destroying the panel. We also suggested donating the panel to the Jim Crow Museum of Racist Memorabilia. As the community debated options, it became clear that using the panel as a teachable moment while preserving its beauty was by the far the best route. Those who couldn’t see why the panel was offensive lost the debate. Those, like Howard Eagle, who believed the panel must be destroyed, lost the debate. Instead we all won. The City spreads the word about the Jim Crow Museum’s offer. Before it’s too late.